Lately, I only step in the Game Room on my way out the door, but I did pick up a brush long enough to put color on these. I present you with members of NKPD’s over-worked, under-paid, under-armed, police force. These honorable men, women, and droids struggle day in, day out to protect and serve the citizens of New Hong Kong against the ever-increasing dangers of crime and corruption in the new century. 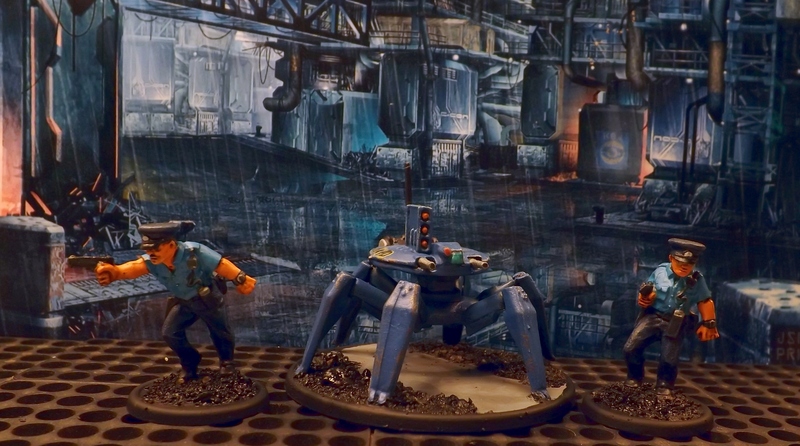 A RAFM Droid adds some serious firepower to NorthStar’s Fistful of Kung Fu Cops set. Two uniforms, a three-man SWAT team, and two characters, these are great figs with loads of character. 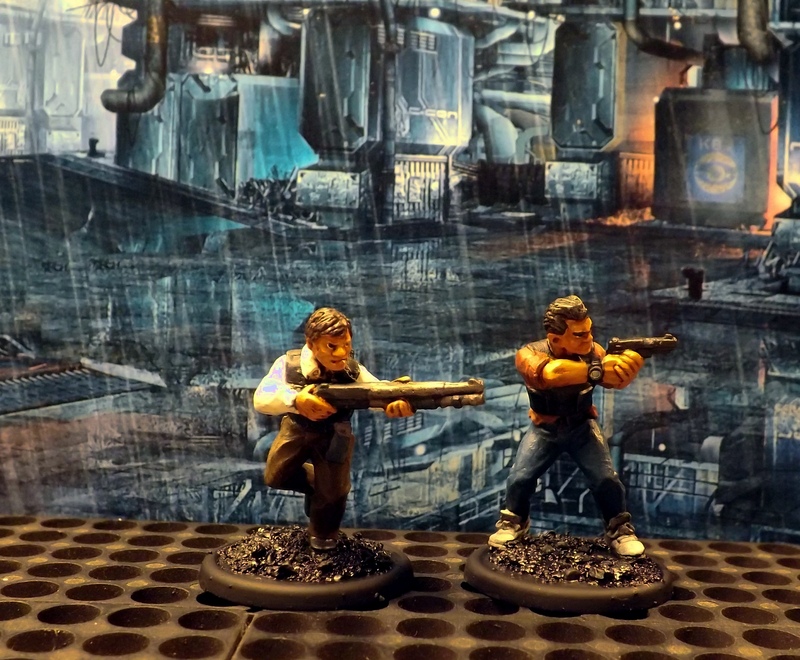 They’re a perfect set for Pulp Alley or your favorite skirmish rules. Our two harried but intrepid heroes. Those AFOKF sets are very nice, they exude the appropriate tropes. The pistol armed detective with the hightops model brings a smile to face every time that I see it. I particularly like what you did with the colours on the SWAT. SWAT tend to look quite generic, by necessity I guess, but you have given yours some sci-fi character. Thanks. 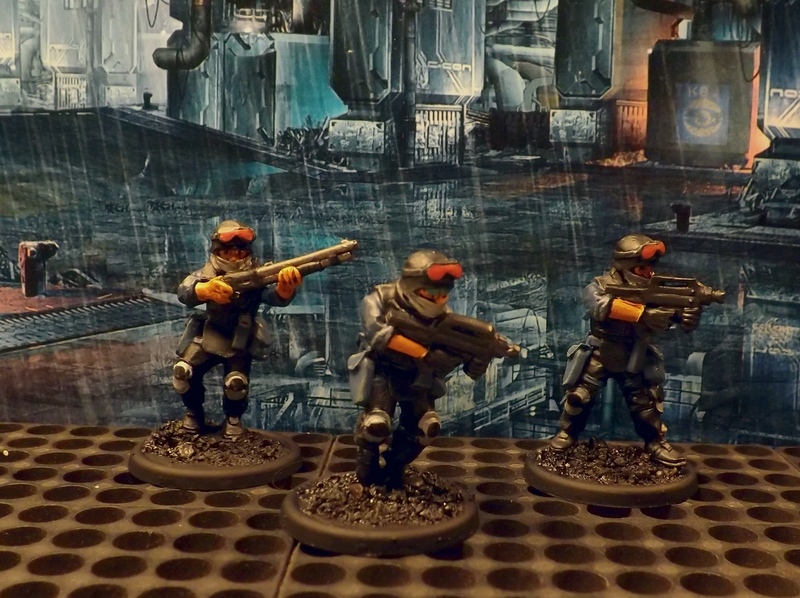 I tried to add some variation to the SWAT figs. They are thoroughly modern, but I figured near-future big-city police would be as under-equipped and stretched thin as their contemporaries. Only obvious ‘sci-fi’ upgrade is the Droid. Interesting enough, the North Star sets are perfect for Pulp Alley. (Hero, Sidekick, Allies, Followers) I plan on slotting them in when my schedule clears in the Fall. Next up: the Yakuza with cyborg support. Very cool. I have plans to get to all of these sub projects, often as sub-sets of Judge Dredd gaming. But its cool to see you tackling so many of the sorts of projects that I am looking forward to. I’ll do my best, altho ‘tackling’ might not be the best description. ‘Brush pass’ is more appropriate these days.